The Oase 60 waterfall kit with stainless steel elements is a chic and elegant accent, perfect for the edge of the pond, in a planter box or as a modern wall design. With the correct flow of water the design ensures a consistent full blade effect with no gaps. Dimensions: 145 x 605 x 600mm (L x W x H), Complete with: stepped hosetail to fit 19, 25, 32 and 38mm hose. Made of robust and non-rusting stainless steel. It is also possible to install with a combination of water reservoir and suitable cover. Simply bolt it onto the reservoir and decorate it with pebbles – that's it! Please see the table below for help when choosing the correct pump. 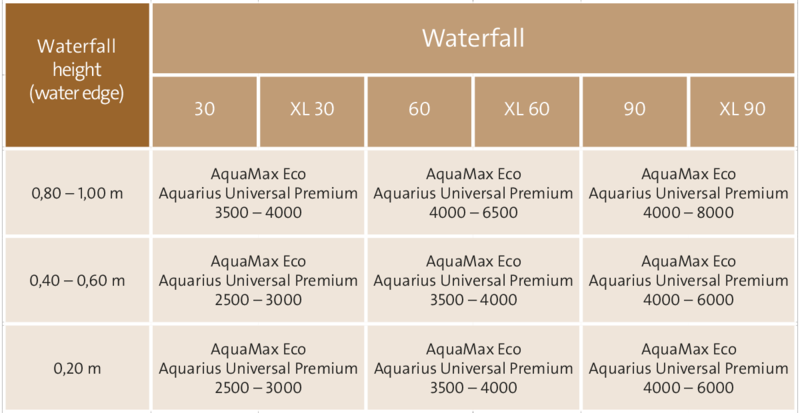 For example if you were fitting a Waterfall set 60 at a height of 60cm from the water level an Oase Aquamax Eco 3500 or Aquarius Universal Premium 4000 would be most suitable.